After is better than before. For the full sample period, average return during the week before (after) the Super Bowl is -0.02% (+0.51%), with standard deviation 2.34% (2.28%). This effect is stronger in the first half of the sample than the second half. This effect also holds for both the 27 American Football Conference wins and the 25 National Football Conference wins (not shown). Sample and especially subsample sizes are modest, so a few more observations could materially alter findings. 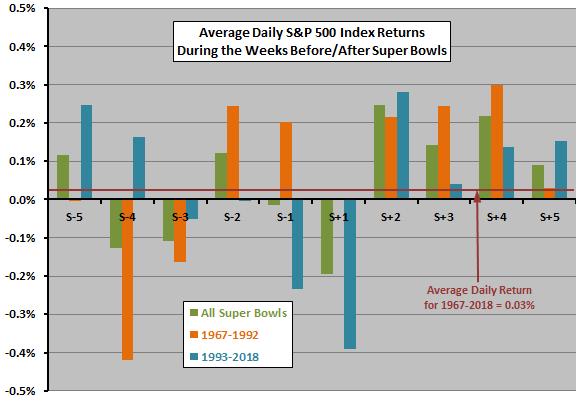 The next chart plots average daily S&P 500 Index returns from five trading days before “Super Sunday” (S-5) through five trading days after (S+5), excluding two Mondays before the Super Bowl that are market holidays. The most consistent indication is mid-week strength after the Super Bowl. Subsample size is only 26, with return variability large compared to average return, so confidence in predictability is low. 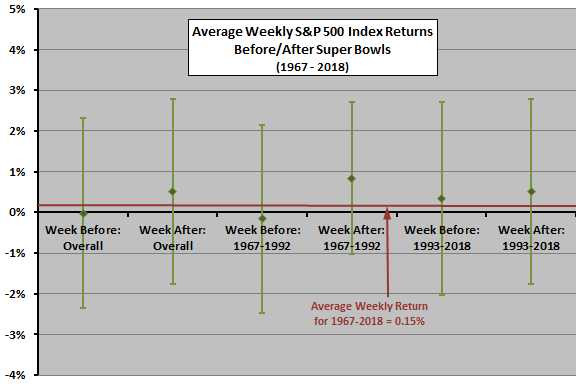 In summary, evidence from simple tests on a modest sample suggests that the U.S. stock market may lean toward abnormal weakness (strength) during the week before (after) the Super Bowl. As noted, any average return indication is small compared to return variability, so experience by year varies widely.